For more information, contact Aliya Chaplin at 317/955-5150, X221, or achaplin@icenterindy.org. In these challenging economic times, building and sustaining trust is more important than ever before. National leaders, scholars, and professionals come together for a one-day symposium to learn how nonprofits can cultivate trust, connect with donors and partners, and continue to make an impact. The whole day is pricy, and space is limited ... Sign up online. Registration costs $250 per person beginning November 8. This session is complimentary and open to the public, but please register in advance. Paul Brest, president of the William and Flora Hewlett Foundation, will give the Donikian Family Lecture. Co-author of Money Well Spent: A Strategic Plan for Smart Philanthropy, he challenges the nonprofit sector to become more strategic and to create meaningful, measurable impact. “Social enterprise”— the notion that businesses can be configured to “do well by doing good”—has received a lot of attention, such as Muhammad Yunus' Nobel Peace Prize, speeches by Bill Gates, a recent Papal Encyclical, and Business Week's and Fast Company Magazine's top 25 lists. This presentation identifies essential characteristics of a social enterprise and explains why conventional for-profit and nonprofit organizational law and forms fail to adequately address the distinct challenges confronting the archetypal social enterprise. It also evaluates new and proposed forms and regimes designed to promote social enterprise-like entities. Robert Katz joined the law school faculty in the fall of 2001. He holds a joint appointment with the law school and the Indiana University Center on Philanthropy at IUPUI, and is on the Affiliate Faculty of the Indiana University Center for Bioethics. Prior to his appointment, he served as a Bigelow Teaching Fellow and Lecturer in Law at the University of Chicago Law School. From 1993 to 1997, he was a trial attorney with the Civil Division, Federal Programs Branch of the U.S. Department of Justice in Washington, D.C. He also served as executive director of a charitable foundation in Massachusetts. Professor Katz’s research interests include legal issues relating to nonprofit and tax-exempt organizations, charitable giving, healthcare organizations, and the recovery and processing of donated human tissue for use in transplantation. He received his bachelor’s degree from Harvard College and his Juris Doctor from the University of Chicago Law School, where he served as comment editor for the University of Chicago Law Review. He clerked for the Honorable Stephen G. Breyer, formerly Chief Judge of the U.S. Court of Appeals for the First Circuit. Dec. 9 -- "A Theology of American Exceptionalism? Iraq, Civil Religion and American Public Morality"
Raymond J. Haberski, Jr., Ph.D., Associate Professor and Chair Department of History and Social Science at Marian University. Ray Haberski, associate professor of History, has a Ph.D. in history from Ohio University. He teaches courses in United States history, including subfields in intellectual, contemporary, Catholic, and movie culture. He co-directs the U.S. track of the History program. As of August 2009, Dr. Haberski will also serve as chair of the History and Social Science Department. Dr. Haberski has written three books, including, It's Only a Movie (2001), Freedom to Offend (2007), and with Laura Wittern Keller, The Miracle Case (2008). He is at work on a book tentatively entitled, The god That Never Failed: Civil Religion and Postwar America for the series "Ideas in Action" at Rutgers University Press. For the 2008-2009 academic year, Dr. Haberski was the Fulbright Danish Distinguished Chair in American Studies at the Center for the Study of the Americas (CSA) at the Copenhagen Business School. He is an associate of both the CSA and IUPUI's Center for the Study of Religion and American Culture. Dec. 27 — Jan. 9, a group of Muslim, Jewish, and Christian Hoosiers will make a trip to the Middle East. Their purpose: to identify potential opportunities for Indiana groups to partner with groups in Jordan, Israel and the West Bank in order to help solve the region's toughest problems. The group will meet with groups working in Iraqi refugee camps in Jordan, strengthening in schools in Bethlehem, and fostering Muslim-Christian dialogue in Jerusalem. All the expenses for the group are covered, so 100% of what is raised December 9 will be delivered directly to the organizations engaged in vital work in the region. It will be our way of demonstrating that we want to be part of the search for solutions. Looking for a unique holiday gift? 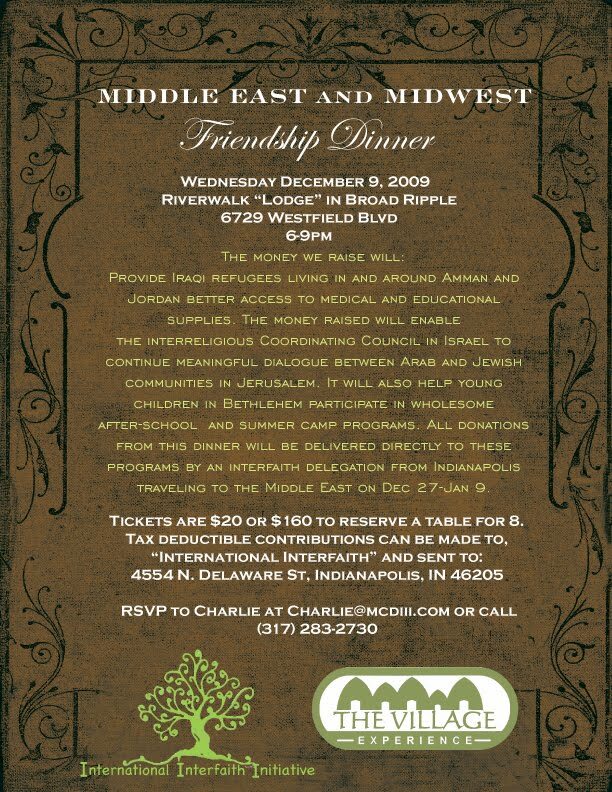 In the name of one of your friends, family members, or co-workers, donate money to one of the organizations with which we will be partnering ... we'll send you a certificate describing the purpose of the MidEast/MidWest trip, and explaining why the group receiving the donation is so important. Your chance to be part of this initiative goes beyond donating money to innovative and essential groups. Follow the trip's blog at http://midwestmideastpartnership.blogspot.com/. Look for opportunities for your congregation, school or club to form a partnership with groups in the MidEast. Join one of the several trips to the region in 2010. Attending the MidEast/MidWest Friendship Dinner on December 9 can be a step toward being part of something truly special. To research a seat or (even better!) purchase a table, please RSVP to Charlie McDonald at charlie@mcdiii.com. New York-based artist Josephine Meckseper has gained international renown for her conceptually based works that employ a variety of media to raise questions about the connections between consumerism and politics in contemporary society. In this talk, Meckseper discusses her diverse body of works, including her two recent films on display in the Carmen and Mark Holeman Video Gallery from October 16, 2009 to February 7, 2010. Meckseper’s films synthesize many of the core issues that she has explored through her works in other media, using imagery appropriated from advertising and documentary footage to create challenging and aesthetically compelling works. The IMA’s presentation of Meckseper’s work is distinguished from prior shows by its exclusive focus on her work in film. Alternately displayed on opposite walls of the gallery, this pair of works will represent contrasting visual strategies one filmed black-and-white with intense sound, the other saturated by color with an unobtrusive soundtrack—and intends to promote a dialogue about the connections between politics and consumerism in contemporary life. 0% Down (2008, video, black and white, sound, 6 minutes) examines present-day society’s intoxication with speed, power, novelty and transformation. 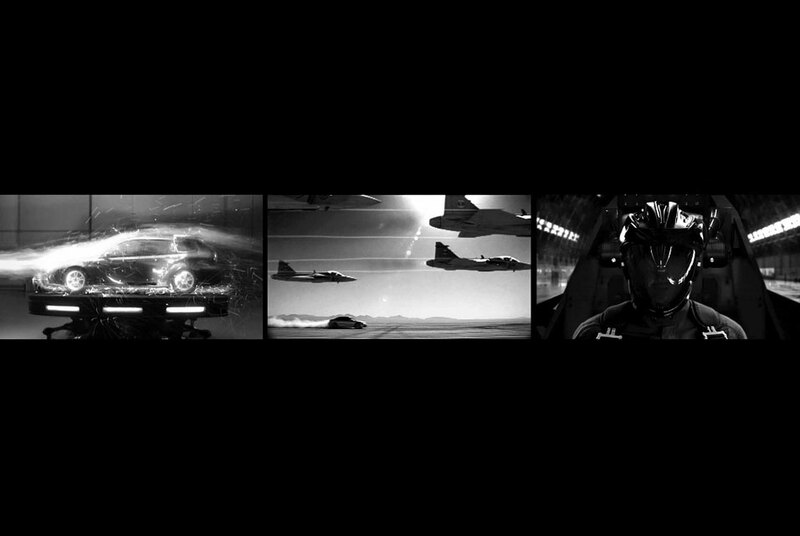 To highlight the hyperbolic character of car commercials created for an American market, Meckseper carefully edits excerpts from these advertisements and sets them to Boyd Rice’s industrial soundtrack declaring “Total War.” Images of slick cars speeding through the desert, squaring off with oil rigs and fighter jets, illuminate the connections between the oil and auto industries and warfare in Iraq. The title 0% Down ironically mimics a commercial come-on, while simultaneously making reference to the recent credit crisis and economic meltdown in which the automobile industry has been a major player. Mall of America (2009, video, color, sound, 12:52 minutes) represents a portrait of the culture of consumption in the United States. The camera meanders through the cavernous spaces of this Minnesota mega-mall, a universe unto itself as it offers almost every conceivable type of shop, attraction and service. Meckseper applies colored filters to abstract and de-familiarize common scenes of store window displays, strolling shoppers and surrounding architecture, and employs electronic music to create a dream-like and surrealistic atmosphere. Reality and heroic fantasy are intertwined in a scene of a U.S. military recruiting station housed in the mall, where mannequins dressed in fatigues and goggles advertise a life of adventure and action to recruits. The camera zooms into view of a military recruitment video in which mock battles are waged, before returning to the routine activities of mall shoppers. In this work, the terrain of the mall is emblematic of our culture and its inevitable connections to global conflict. 4 to 5:30 p.m. at the Eugene and Marilyn Glick Indiana History Center, 450 West Ohio Street. Enjoy crafts, movies, a piñata-making demonstration, and a “pastorela” by Christ Church Cathedral. 5:30 p.m. Canal procession of peregrinos begins; enjoy student-created art projects sponsored by the Indianapolis Art Center and IMCPL. Family and friends gather and reenact Mary and Joseph’s search for shelter by carrying lit candles, singing special songs and following figures of Mary and Joseph that are carried aloft in a procession. When these pilgrims, or peregrinos, reach predetermined stops, they divide into two groups. One half of the group begs for shelter, while the other half refuses them. At the last stop, usually someone’s home, the doors are opened in greeting and a grand celebration begins where families break piñatas, drink ponche and eat treats. Join the Indiana Historical Society, Eiteljorg Museum, Christ Church Cathedral, Indianapolis – Marion County Public Library, Indianapolis Art Center, Consulate of Mexico in Indianapolis, and Indiana Commission on Hispanic/Latino Affairs to celebrate this festive family tradition. Fran and Aimee Kandrac, founders of “What Friends Do”, will speak about their journey to enable everyone to help people in need throughout the world. Part of the "Fall 2009 Faith in Action Series" at 2nd Pres ... put together by Elder Jim Lemons and Rev. Carol Johnston. Why should you attend this event? Who'd have thought friends need a support group ... but they do. If you think this event sounds interesting, be sure to check out … Jeffery Zaslow when he reads his book of 10 women's remarkable friendships, The Girls from Ames November 14, and the "speaking of Women's Health" conference August 28 has a keynote speech on "The Ordinary Miracle of Friendship"
Dec. 13 -- Sen. Lugar on "America and the World: A View from the Senate"
Why should you attend this event? Even though he is far from the most magnetic speaker in American politics, when Sen. Lugar talks it is riveting. Without notes he will take the audience on a tour of the most troubled spots in world, offering nuanced analyses and realistic solutions. It is an impressive show. So what's going on at this event? Richard Lugar is a longstanding advocate of U.S. global leadership, free-trade, and a strong national defense. A Rhodes Scholar and former presidential candidate, he has been nominated for a Nobel Peace Prize for his role in reducing the stockpile of nuclear weapons in the former Soviet Union. A fifth generation Hoosier and the longest serving U.S. senator in Indiana history, he is chairman of the Senate Foreign Relations Committee. This is an experience that no one should miss. This talk should be a reality check of sorts for many of the discussions happening around Indianapolis this spring. Sen. Lugar probably represents the best combination of power and thoughtfulness we are likely to see in the Senate. That doesn't mean we should limit our ambitions only to what the Senator thinks is realistic ... it means that when he says a course of action is not realistic, we may have to make it happen ourselves, without waiting for the government in DC to do it for us. Marty Feldstein has been noted as one of the top 10 economists in the world. Feldstein's rare skill set generates bi-partisan demand for the former chief economic advisor to President Reagan. Dr. Martin Feldstein, George F. Baker Professor of Economics at Harvard University, has served both Presidents G.W. Bush and Barak Obama on top advisory boards. As a long time Harvard professor, his former students include some of the most powerful players in modern economic policy. He is an advocate for social security reform, a board member of numerous organizations (including Eli Lilly) and a regular contributor to the Wall Street Journal and other publications. While other economists hedged their bets, Feldstein went on record and identified the U.S. as being in a recession two years ago. His expertise and advice on weathering the storm is regularly sought by governments and organizations both domestically and abroad. The 9th “Santa Comes to Town” Christmas charity event provides personal care products, medical items, education and legal services to over 1,400 families. Toys will be distributed to 5,000 children (age 1-9) during this full day event. When: December 17th 11 a.m. - 6 p.m. According to the Census, the Latino population is the fastest growing ethnic group in Indianapolis. They are also most likely to live in poverty. Dec. 22 -- Richard Gunderman discusses "Jesus as Healer"
Richard Gunderman, MD, PhD, Professor of Radiology, Pediatrics, Education and Philosophy at IU, teacher at the Center on Philanthropy and author of several books including “We Make a Life by What We Give”, is considered to be a wonderful humanitarian and philosopher who writes and speaks with beautiful and unique insights. Why should you attend this event? Gunderman is good, a person of substance as well as a fine communicator.